Stock photo of a double rainbow during a thunder storm in the city of Regina, Saskatchewan, Canada. Double rainbow captured during a thunder storm in the city of Regina, Saskatchewan, Canada. 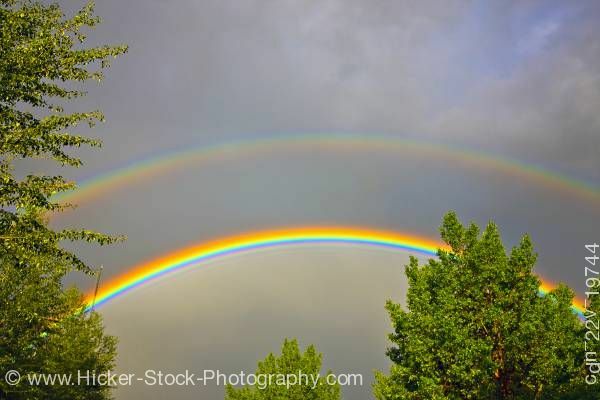 This stock photo shows a dazzling double rainbow forming with its many colors during a thunder storm in the city of Regina, Saskatchewan, Canada. This lower rainbow is brilliant and dominates this photo with its spectrum of colors. The amazing rainbow showing awesome colors of deep red, bright orange, soft yellow, light green, dark green, light blue or cyan, medium blue, brilliant royal blue, lovely indigo and then a wonderful violet. Some of the colors repeat on this vividly detailed rainbow to a smaller yellow, green, indigo, and violet soften the brilliance. The rainbow above is softer but just as colorful and the one below it. The colors are shown in reverse of the other. The sky above the rainbow is a dark gray with dark, shadowy clouds and below is a lighter gray. Three lush green trees of varying heights show in the foreground.